Early Christian tradition testifies to the Apostle John as the author of the Gospel of John, who was assisted by Prochurus as the scribe. Irenaeus (180 AD), Clement of Alexandria (200 AD), and other early Christian writers all agree the Apostle John is the author of the 4th Gospel. Although not directly stated, the author identifies himself in John as “the disciple whom Jesus loved” (2:17, 20; 13:23; 19:26; 20:2). 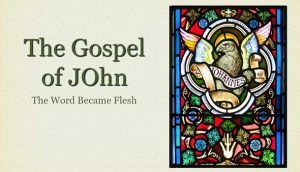 Most scholars believe John wrote the 4th Gospel sometime in the decade of 90 AD. The earliest surviving fragment from John’s Gospel is “Papyrus 52,” which dates from 130 AD, containing a few words from John 18. Instead, we find Jesus’ teaching what is to come. For baptism, Jesus tells Nicodemus about the need for Baptism, which He will later institute (John 3:1-5). For His Supper, Jesus speaks of its necessity to His disciples (John 6:53-58). In both cases, John assumes his Gospel recipients will “get” the baptism and Supper teachings because they already know of their institutions from the other three Gospels. dialogue with Nicodemus and His ministry in Samaria. Jesus being explicitly identified with God. John expects his hearers/readers to understand the Jewish background of the events taking place. For he doesn’t go into depth explaining them, presuming such knowledge. When people Jesus, “Are you greater than our father, Jacob?” (4:12) and “Are you greater than our father, Abraham?” (8:53), John expects us to know about Jacob and Abraham, which included not only Scripture but the Jewish traditions. If not, we won’t understand chapter 4 and 9 of John’s Gospel. Likewise, Jesus actions during the Feast of Dedication in John 10 remain cryptic apart from Jewish tradition and knowing 1 and 2 Maccabees in the Apocrypha. Without such knowledge, Jesus statement, “You are gods” is either ignored or susceptible to heretical interpretations (John 10:34). Though John expects to know the Jewish background, He is also writing to Gentiles. For he translates Jewish or Aramaic terms such as Rabbi, 1:38, Messiah, 1:41, and Cephas, 1:42. He also explains the meaning of some cultural details (4:9), which Jews who lived in the Judea would know but not those who didn’t would not. So, John didn’t expect Gentiles to know specific Jewish terms and Judean familiarity. Still, he did expect Gentiles in the Church to understand the Jewish traditions and Greek Septuagint as Scripture, which included the books of the Apocrypha. John stated why he wrote the Gospel. “These are written that you may believe that Jesus is the Messiah, the Son of God, and that by believing you may have life in his name” (John 20:31). This reveals His understanding of salvation not to be static but always taking place. For the knowledge He assumes of His readers to know is of someone already in the Church. Note: This section is referred to the “glory of Jesus” because it centers on the events through which He reveals the glory of God: the infinite exchange of love between the Father and the Son. Logos, translated as “Word,” is a term the New Testament uses some 330 times. It can also mean “statement” or “utterance.” In John’s day, logos was a word steeped in Greek philosophy. Ancient Greek philosophers associated the Logos with the order and design of the universe, even its soul. Logos was creative energy, from which everything received its being (it sounds eerily God-like in some ways). Though John used the word logos, he was also high-jacking a word that had long become vogue in Greek philosophy and pulled it into a biblical worldview. And even beyond that, John would bring his readers to the One who fulfilled and was that Logos: Jesus. In the Greek translation of the Old Testament, the Septuagint, we find the Greek word logos as the authoritative utterance of God that brought life into being. “By the Word [Logos] of the Lord were the heavens made” (Psalm 33:6; see also Genesis 1:3 and Wisdom 9:1). The Septuagint links the Word [Logos] of God with the Wisdom of God, whom it also depicted as God’s eternal companion (Proverbs 8:23; Sirach 24:9), who remained the source of life for the world (Proverbs 8:35). So, the Logos in the Old Testament is God’s self-expression, and the personification of the Logos becomes God’s ultimate self-disclosure to us: The Person of His Son. John takes these Old Testament Logos themes and shows how Jesus fulfilled them. Still, John isn’t the only New Testament writer to do this. The Apostle Paul also ascribes to Jesus qualities and abilities given to Wisdom in the Old Testament (Philippians 2:5-11 and Colossians 1:15-20). The Jew will remember that “by the Word of the Lord were the heavens made” (Psalm 33:6). The Greek will think of the rational principle of which all natural laws are particular expressions. Both, however, will agree the Logos is the starting-point of all things. 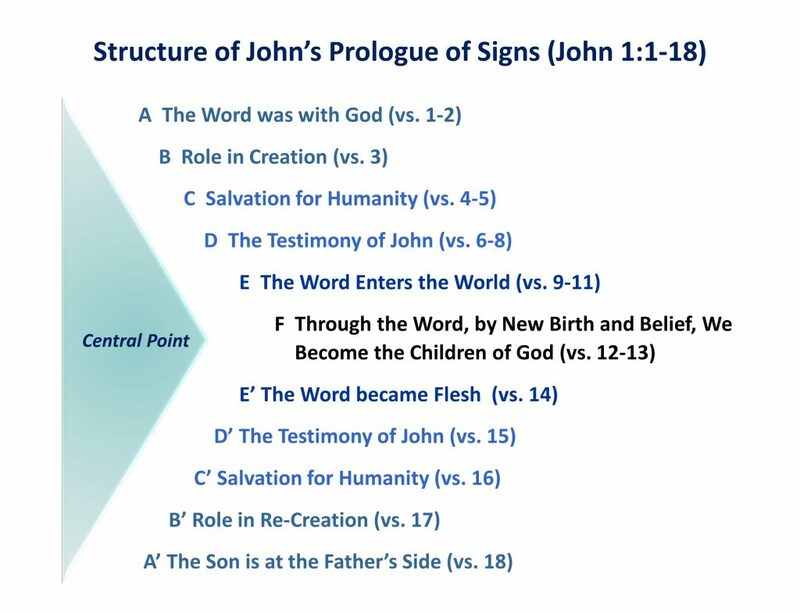 John shows that in Christ, the idea of Logos moves beyond an abstract reality of God’s power in His utterance to the Divine Person: God the Son (Revelation 19:13). The eternal Logos becomes the author of salvation by becoming incarnate (John 1:14, 3:17). Nevertheless, we must never separate the Logos’ incarnation from His utterance, for the Person of Jesus unites the two. As the Logos of the Old Testament, the utterance of the Logos-become-flesh also is the divine power to bring into being what He says. This connection between logos as utterance and Logos as Divine Being bring about the salvation-causing reality from the acts Jesus commanded His Apostles to do: baptism, preaching, confession and absolution, and the Lord’s Supper. So, if we under-appreciate the Logos’ incarnation, we will under-appreciate His means of grace. For we then fail to recognize God’s use of His physical matter in both when it comes to our salvation. What does “in the beginning” bring us back to? The words and acts of Jesus are then the words and acts of whom? Besides being “God,” what does the Logos have within Him? “Life”: “Life”, Greek, zoe. John uses “life” 36 times. No other New Testament writer uses it more than John, for Revelation comes in second at 17 uses. Over 25% of all the New-Testament uses of “life” are in John. The Logos, Jesus, shares the essence of the Father, although the Word is not the Person of the Father. The Logos is God but is not the Father. The rest of John’s Gospel will help us understand the nature of this relationship better. In verses 9-11, what period of Jesus’ life does John cover? How does one “receive” Jesus? 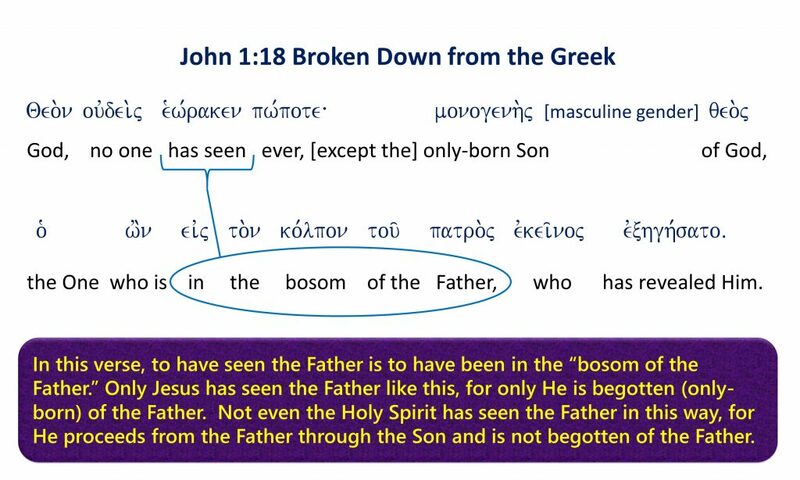 How is one “born of God”? Is there a conflict between the two? How is Jesus different from any other human ever born? How is Jesus different from Moses? What does that mean? Through “grace and truth,” what does Jesus create for us?